The in Store Winemaking fee includes the making of the wine + corks. This rich, full-bodied red wine may require long aging, preferably in an oak barrel, to bring out its dark, earthy tones and floral beauty. Intense flavours of violet, rose, red cherry, truffle and licorice mingle with traces of toasted oak. Barolo is known for producing a dry wine with a firm acidity and it can also be heavily oaked (optional). Optional: In Store Winemaking Price $76.50 + tax. Cabernet Franc tends to be a less tannic and acidic wine with a lighter body and colour. It also tends to be more aromatic and herbaceous than most reds. Cabernet Franc is often paired with red meats, game, lamb and duck. Altogether, Cabernet Franc is known for being a medium bodied wine and it does not require oaking. This is the world’s most popular red wine. Cabernet Sauvignon is very tannic when young and it is often blended with Merlot or Cabernet Franc to cut down on aging time and to soften the tannins. Cabernet Sauvignon is known for being a dry, heavily oaked wine (optional) and it is also medium full in body. This blend mixes the textures, firm tannins and aromas of spice and cherry of Cabernet with the long, complex finish of Merlot. In addition, Cabernet/Merlot often produces wine with hints of vanilla, dried fruit, herbs and orange. Although it can be enjoyed early, Cabernet/Merlot is best consumed after it has been aged. Altogether, Cabernet/Merlot is known for being a dry, medium oaked wine and it is also medium full in body. The Cabernet in this mix provides rich blackberry flavours and a hint of vanilla while the Shiraz adds a touch of fresh raspberries, hints of cedar, cherry, mint and clove that rise up to the palate. The Cabernet/Shiraz blend should be aged in order to soften the tannins before being served. Altogether, Cabernet/Shiraz is known for being a dry, heavily oaked wine (optional) and it is also medium full in body. California Red is a dry, robust French style wine with an aromatic black cherry bouquet. It has a deep colour and a fruity, well-rounded flavour of cranberry and cherry. California Red is an easy drinking wine since it is shallow and dry in nature. Although it can be consumed when young, California Red is thoroughly enjoyed after it has been aged for at least three months. California Red pairs well with aged cheeses, beef stews, pork and lamb. Altogether, California Red is known for being a full bodied wine and it often requires medium oaking (optional). This popular French red wine is full bodied, yet surprisingly soft and quick to mature. Château de la Reine is deep red and aggressive with complex flavours resulting from a blend of grape varieties that layer flavours and aromas of ripe fruit, berries, plum, spice and oak. Château de la Reine is known for being a dry wine that is medium oaked (optional). This classic, medium, Italian red wine is admired for its richness and velvety texture. Chianti is rich, spicy and complex with hints of ripe cherries, a refreshing acidity and a tannic backdrop. The crisp, clean spice of this wine goes well with Italian food. Altogether, Chianti is known for being a dry, heavily oaked wine (optional) and it is also medium full in body. This youthful, juicy wine is high in acid and low in tannin. As a result, it is best enjoyed young. Flavours of cherry, berries and plum linger softly on the palate. The lightness of this wine allows it to pair with foods that would normally be reserved for whites. Altogether, Gamay is known for being a dry, medium oaked wine (optional) and it is also medium full in body. This wine tends to be made with a slight sparkle and lower alcohol content. Unlike most other grape varieties, there was no definitive grape ancestor for Lambrusco. As a result, its flavours can vary greatly from vineyard to vineyard. Altogether, Lambrusco is known for being a dry wine. It is also medium full in body and does not require oaking. Merlot is a soft, silky, friendly wine. It is also fruity and rich with flavours of black cherry, plum, vanilla, oak, violets, dark fruits and hints of cedar. Merlot is a versatile wine that is best enjoyed with roasted red meats, salmon, duck, mushroom dishes and pasta with red wine and tomato sauce. Altogether, Merlot is known for producing a dry wine. It is also medium full in body and does not require oaking (optional). Petite Syrah is a robust, deep red wine with higher tannin levels and a favourable aging potential. It is often blended with Zinfandel to add some zest and complexity to the finished product. Petite Syrah is frequently paired with roasted vegetables and red meats. Altogether, Petite Syrah is known for being a full-bodied wine and it often requires medium oaking (optional). Pinot Noir is brilliant red in colour with a slightly spicy nose. With hints of citrus notes, Pinot Noir often leaves a soft fruitiness on the palate. As a young wine, Pinot Noir displays simple red fruit flavours like cherry, strawberry and raspberry. With some age, it acquires more complexity, along with various aromas of chocolate, venison, figs, prunes, truffles and violets. Pinot Noir is often paired with cheeses and red meats. Altogether, Pinot Noir is known for producing a dry, medium bodied wine and it does not require oaking (optional). Premium Red is a smooth, round wine with velvety and subtle notes of berry. It is dry and medium in colour, offering flavours of raspberry and cassis, along with aromas of bell pepper. Premium Red is low in tannin and crisp on the palate. Although it ages well, Premium Red can be thoroughly enjoyed when young. Premium Red is often paired with smoked meats, along with fowl and strong cheeses. Altogether, Premium Red is known for being a medium bodied wine and it often requires medium oaking (optional). Ruby Cabernet, a cross between Carignane and Cabernet Sauvignon, is often used to increase colour intensities in blends. Furthermore, Ruby Cabernet often produces a light table wine with a mellow taste. While it lacks complexity, Ruby Cabernet can be quite earthy in flavour. 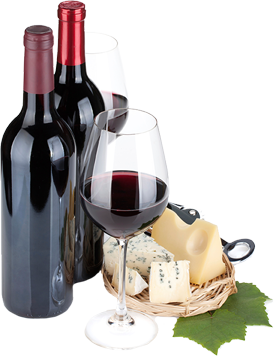 Ruby Cabernet often pairs well with pork, chicken and full-flavoured cheeses and it does not require oaking (optional). Shiraz is full bodied, bold and spicy with flavours of mixed berries, black pepper, anise and oaky vanilla tannins. With its intense colour and jam-like flavour, this wine can be enjoyed relatively young. Although this is true, Shiraz is best served when aged for a few months. Altogether, Shiraz is known for being a dry, heavily oaked wine (optional) and it is also light in body. This refreshing, complex, medium bodied red wine has a delicate bouquet and a rich texture. Its gentle fruit flavours are also enhanced through the fermentation of its dried grapes. Valpolicella possesses solid tannins and acids that enchant the palate. It is often paired well with beef and Italian dishes. Altogether, Valpolicella is known for being a dry wine and it does not require oaking (optional). As a red wine, Zinfandel has a rich character with brambly raspberry and blackberry flavours, savory spiciness and hints of chocolate and violets. It also has cherry and blackberry aromas with subtle notes of strawberries. Zinfandel is known for producing a dry wine that is medium full in body. Furthermore, Zinfandel is best consumed with pepper steak, spare ribs and spicy pastas. It does not require oak (optional). Blush Chardonnay is known as the pink-berried mutation of the original Chardonnay grape. This grape creates wines that have strong aromas with tropical fruit, melon, citrus and green apple flavours. Wine conditioner is optional . California White has a delicate bouquet of peaches and apricots. It is known for being a robust, full bodied wine with a citrus tang and a crisp, clean finish. California White pairs well with grilled or barbequed chicken and other white meats, making it a delightful summer favourite. It is often lightly oaked (optional). Chardonnay is the number one selling white wine due to its high yield and the amazing variety of flavours and tastes it can provide. Furthermore, it has buttered, oaky overtones and fresh fruit flavours such as apple, pear, citrus and melon. Altogether, Chardonnay is known for being a dry, heavily oaked wine (optional) and it is also medium full in body. This is a distinctive dry white wine. Chenin Blanc can be medium dry with a lush fruity bouquet. It also complements the flavours of apples, cinnamon and honey. Chenin Blanc is light bodied and, therefore, paired well with salads, cheeses and light pasta dishes. Chenin Blanc is typically enjoyed after being aged for no more than three months. Generally light in colour, French Colombard is crisp yet moderately dry. It also has a fragrant fruit bouquet, making it best consumed when young and well chilled. This wine is also brought to a long finish due to a hint of acidity. French Colombard is best enjoyed with fish and poultry, making it a delightful summer favourite. Altogether, French Colombard is known for being medium bodied. It does not require oaking. Often barrel-fermented, Fumé Blanc has an aggressively herbaceous, grassy sharpness that combines well with acids and minerals of the soil. It has intense green citrus and berry fruit flavours. Since it has notes of tart fruit, it is often paired well with creamy cheeses and fish. Fumé Blanc is thoroughly enjoyed when young. This is a very full, exotically flavoured wine. It is lightly oaked with chords of rose, tropical fruit such as lychee and spice. Gewurztraminer has a slightly sweet beginning with a medium-dry finish. Altogether, this gives it an elegant, light and very refreshing quality. Gewurztraminer is also known for being an off-dry wine. This sweet, gentle wine is named after the Liebfraukirchen monastery in Germany and is made from Riesling, Muller-Thurgau, Silvaner or Kerner grapes. Altogether, Liebfraumilch is known for being an off-dry, full bodied wine. Pale yellow in colour, Piesporter has a floral nose reminiscent of apple blossoms and exotic fruit notes. Piesporter is fresh and subtle as opposed to overpowering, making it particularly enjoyable with fruit, seafood, ham and veal. Altogether, Piesporter is known for being a medium bodied wine and it does not require oaking. Pinot Blanc often has soft undertones of apples and peaches. It is a richly toned, delicate wine with a floral aroma and velvety taste. As a result, Pinot Blanc is best consumed when young. It is also thoroughly enjoyed when paired with seafood, salad and white meats. Altogether, Pinot Blanc is known for being a full bodied wine and it does not require oaking. Pinot Gris is unique among the white wines since it can possess red wine capabilities on the dinner table. It is semi-fragrant and crisp, with honey, wildflower and smoke adding to this light wine. Altogether, Pinot Gris is known for being a dry wine. It is also medium full in body and does not require oaking. Premium White, a blend of Sauvignon Blanc and Semillon, has a smooth, delicate flavour that is reinforced by a fruity bouquet. This blend creates a crisp, dry wine with aromas of figs, flowers, honey and grass. Since it is low in acidity and has a nice finish, Premium White is thoroughly enjoyed with salad and stir-fry dishes, shellfish, grilled chicken and other white meats or poultry. Altogether, Premium White is known for being a light bodied wine and it often requires light oaking. Riesling, the most notable white wine grape from Germany, is also known in France’s Alcase region, New York’s Finger Lakes District, California and Washington. Riesling has medium to high acidity and light to medium body with a distinct flowery, fruity aroma. Altogether, Riesling is known for being an off-dry wine and it also does not require oaking. Smoky flavours of apple, grass and olive set against a crisp acidity make the Sauvignon Blanc similar to a Chardonnay, only leaner. It can be heavy or light, while its acidity allows it to cut through foods which might ordinarily be too heavy for lighter wines. Altogether, Sauvignon Blanc is known for being a dry wine. It is also medium full in body and does not require oaking. This medium bodied, refreshing white wine with a delicate aroma and clean, dry character is lively and crisp. Verdicchio has flavours of lemon and pear on the palate with hints of fruit and almond, while herbal aromas dominate the bouquet. Altogether, Verdicchio is known for being a dry wine that can be heavily oaked (optional) and it is also medium full in body. The smooth, clean, well-balanced Vintage White does not require oaking, but its light simplicity will be enhanced by it. It is refreshing and clean with a lightly tannic quality, floral bouquet and fruity citrus flavour. Vintage White is known for being a dry wine and it is also medium full in body. Light, crisp and refreshing, this wine is pastel rose in colour and has a delicate bouquet of strawberries and raspberries with floral notes and a hint of spice. Its light body and clean, well-balanced flavour make it an easy drinking favourite. Rosé wines and blushes usually pair best with light Mediterranean dishes and slightly spicier fare. White Zinfandel is known for being a dry, light bodied wine and it does not require oaking.